The Centre for Membrane Science and Technology at the University of New South Wales was originally established as a University Centre in 1987, and a Commonwealth Special Research Centre in February 1988. 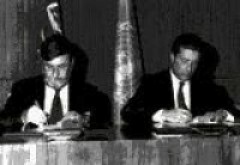 In 1992, Mr. Barry Jones MP signed an agreement on behalf of the Centre with UNESCO by which the Centre was awarded the status of a UNESCO Centre for Membrane Science and Technology, one of only four UNESCO Science Centres worldwide. The UNESCO Centre functioned under the auspices of the Commonwealth Special Research Centre. The aims of the UNESCO Centre are detailed in this report and focus on international collaboration, with Australia as a major player. The Centre has established a network of technical liaison and collaboration in Australia, including various research groups and other Centres within the University of New South Wales, other Universities and Government research organisations. Internationally the Centre has a growing network of collaborators and potential collaborators, including a growing link with EU networks. These activities have been further strengthened by the Centre’s UNESCO status. Close liaison is also maintained with Australian industry, and the Centre provides a significant technological resource for independent and objective assessment. A key element of the success of the Centre is the focus of membrane science and technology which recognises that the experimental and theoretical analytical tools developed for the fundamental study of membranes, can hold keys to the successful development of high performance membranes for industrial purposes. The Centre is hosted by the School of Chemical Engineering in which the five academic staff are based. At the end of 2005, Professor A. G. Fane and Professor Dianne Wiley stepped down as director and deputy director respectively, and Professor Vicki Chen became the new director of the Centre till 2014. In 2014 Professor Greg Leslie has become the Director of the Centre.